Two cars crashing slowly together over the course of forty-five days in Jonathan Schipper's show at Boiler at Pierogi came to a halt yesterday evening. Windows were broken, chassis deformed, and the cars lifted into the air by the pressure of the powerful motors, pushing them forward at a glacial pace. Given the current status of America's auto industry, it's hard not to read it allegorically. For our last Art Trend post, we discussed fire. This time, the topic is the car, which, as a subject and a material, has been enjoying a resurgence in popularity in contemporary art. Update: Anaba brought up the completely fascinating work of Salvatore Scarpitta, which I had never seen. Joan Boykoff Baron and Reuben M. Baron also highlight John Chamberlain, Chakaia Booker, and Dirk Skreber this month in Art Critical. Richard Prince played a major role starting all of this. After decades of photography using the imagery of the motorcycle and muscle car subcultures - and, more recently, brandishing car hoods as paintings and tires as sculptures - Prince decided to start fabricating his own muscle cars. Here's one of the non-pornographically-painted works, which showed at Freize. Like Prince, Chicago artist DZINE is working with real, operating cars. Pimp Juice appeared at Miami Basel in 2007 and is part of The Pig show out at Deitch Long Island City (which we covered in a previous post). According to the Times: "Complete with 14 speakers, a custom video mix playing on five screens and special chrome and 24-carat gold hydraulics that make it buck and hop." Also, there's a great paint job that you need to see in person. Lowman and Colen reworked a 1971 Jaguar, while Jonathan Monk did a little mash-up of Prince form and Ruscha content. Meanwhile, Andrew Bush's show at Yossi Milo, which also just closed, featured portraits of people while driving. Super elegant but also a little scary: everyone looks vulnerable and trapped, like frames from Texas Highway Murderer film in Underworld. Then there's the sub-genre of partnerships between car companies and artists. BMW has been doing it for a while with artists like Warhol (which makes sense), Rauschenberg (a little stranger), Holzer (awkward). This year, Robin Rhode was in charge. See them all. Fiat also got involved, commissioning Tracey Emin to produce four decorated cars. Finally, we get to the classics. 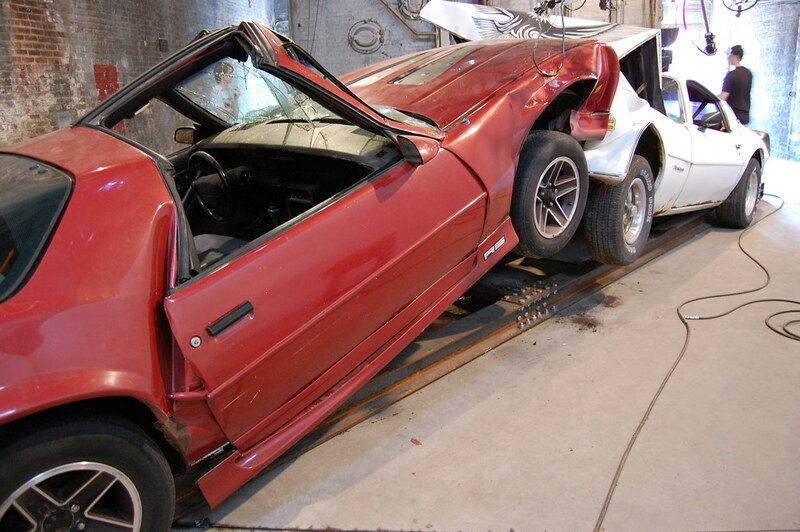 Charles Ray's fiberglass replica of a destroyed car, easily one of my favorite pieces at the Walker, and Ant Farm's monument out in the desert. Chris Burden, Trans-fixed [Performance view], 1974. Finally, we end with the extreme ancestors of today's works. Burden's inclusion is a bit of a stretch, but he had plenty of options for sites, and he chose to nail himself to a Volkswagen. Arman's example, the earliest on our list (though please do send us examples of the works we missed), in which he takes the simplest and most direct approach, blowing up advertising executive Charles Wilp's MG convertible. Salvatore Scarpitta... click the link at my name... his family is working on a new website.